Part 1 Chemoreception and structure-activity relationships: Toward a rational structure-function analysis of odour molecules: The olfactory receptor TM4 domain; The impact of recombinant dna-technology on the flavour and fragrance industry; The design and synthesis of novel muguet materials; Aura of Aroma®: A novel technology to study the emission of fragrance from the skin; Dependence of intensity of musk odour on the energy gap between frontier molecular orbitals. Part 2 Essential oils and analytical: Derivatized cyclodextrins in enantiomer gc separation of volatiles; Production, chemistry and sensory properties of natural isolates; An odour-sensing system for use in measuring volatiles in flavours and fragrances using OCM; The aromatic resins: Their chemistry and uses; Studies towards structure determination of substituted pyrazines. Part 3 Flavours: Synthesis and odour properties of chiral fragrance chemicals; In search of nascent musks - or not; Synthesis and application of thiocarbonyl compounds; Heteropoly acids as catalysts for fine chemicals synthesis. 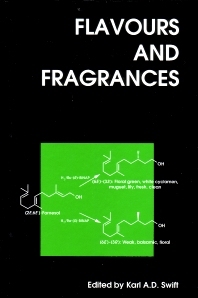 This is a compilation of papers presented at the 1997 Flavours and Fragrances conference. The subject matter is intentionally broad, covering areas such as chemoreception, analytical techniques, essential oils and the synthesis of flavour and fragrance materials in the laboratory.